Brian Allard was looking for his second major league victory. The opposing pitcher he had to get through to get that second win was only coming off a perfect game, Len Barker. Allard ended up going seven innings, giving up four hits and a single run, getting that second win. He also did it, he told The Associated Press later, by pitching sticking to his game. "My main objective is to get as many groundball outs as I can," Allard told The AP afterward, "because I'm a groundout pitcher." Allard got that second major league win in his third season with time in the majors. He ended up getting just two more big league wins. But he did go on to a career working with younger pitchers, trying to get them to their main objective, the bigs, though he never returned to the bigs himself. Allard's baseball career began in 1976, taken by the Rangers in the fourth round of the draft, out of Henry High School in Illinois. Allard started with the Rangers in rookie ball, then moved to single-A, AA and AAA in successive years. The year he made AAA, he also made the majors. Allard debuted with the Rangers in August 1979. He got into seven games, starting four. He picked up his first big league win, as well has his first three losses. Allard returned to Texas for 5 games in 1980, two starts. He gave up nine earned runs in 14.1 innings, going 0-1. He then got that final time in the bigs in 1981, with seven starts as a Mariner. He went 3-2, with a 3.75 ERA, ending his big league career. Allard, though, continued playing in the minors through 1984, playing his final seasons with the Mariners at AAA. Out of his playing career then came his coaching career. He began in 1985 at AAA Maine, then moved to single-A Waterloo for 1986. 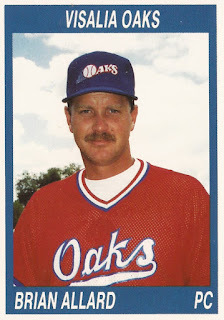 By 1990, he was with the Twins, serving as pitching coach at high-A Visalia. At Visalia, Allard watched over young closer Richard Garces. Garces moved up to AA Orlando by August. "He's got quite a future ahead of him," Allred told The Orlando Sentinel of Garces, who went on to pitch in 10 major league seasons. "He has an above-average fastball and a sharp breaking curve. If he gets both pitches over, it's all over." For 1994, Allard served with the Tigers at high-A Lakeland. There, he worked with young pitcher Rick Greene on his delivery, as Greene came back from an injury, The Lakeland Ledger wrote. By 1996, Allard was pitching coach at AAA Toledo. One of his pitchers there was a young Jose Lima. Lima went on to a career that spanned 13 seasons. That May in 1996, though, Lima was coming off an outing at Toledo where he gave up seven earned runs and didn't get out of the fourth. "He's been to the big leagues three times now, and he keeps getting sent back," Allard told The Toledo Blade of Lima. "So something's got to change. His command is what's lacking and command mostly starts with his concentration level."